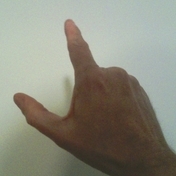 Lunatics and liars — i.e.- federal attorneys and judges — matter-of-factly state that fingers are triggers, and the only difference between a machinegun and a semi-auto is whether the finger is moved volitionally. Some people don’t quite grasp that, so allow me to illustrate. Under the new definition, this is a semi-automatic trigger group. And this is a fully automatic trigger group. I expect the ATF to kick in my door over that NFA finger any time now. Should you be confused why the volitional movement of the off arm doesn’t count, the ATF has that covered.